There is a certain group of dogs in New Hampshire that is homeless for the holidays. Four Pit bull mixes at the New Hampshire SPCA have been at the shelter longer than any other dogs. "It's hard, you know," said SPCA employee Kelly Marinel as she started to tear up. "I'm going to cry." She's got a special bond with Uma, who has been at the shelter for almost an entire year. 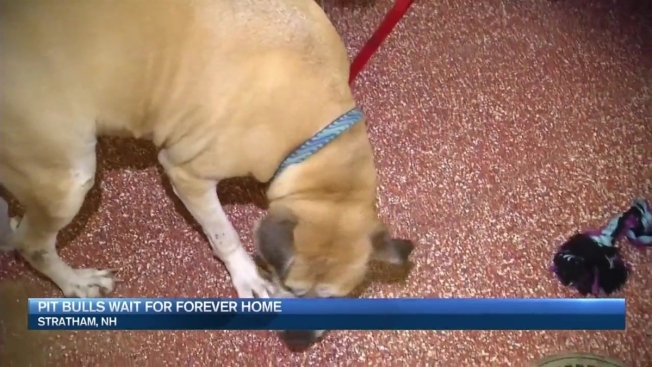 "It's tough seeing her here every day, getting looked over, and watching other dogs come and go," Marinel said. Marinel says people walk right by Uma, in large part, because she's a pit bull. "There's a lot of breed bias," said NHSCPA Executive Director Lisa Dennison. "It's not uncommon for a pit bull to be here three, four, five, months, but this is getting to be a long time." A long time not just for Uma, but for the three other pit bull mixes at the shelter. Jato and Vander have been at the shelter about six months. In January, Tanner will have spent a full year without a family. "Every animal deserves a chance," Dennison said. "When you take them out of their kennels, they are love-bugs." Meredith Robie adopted her pit bull from the SPCA last year. "I fell in love, he's the best cuddle buddy ever," Robie told necn. She drove an hour to the shelter Thursday for the chance to show others her relationship with her beloved dog, Tyson. "Pit bulls just want affection from people," Robie said. She hopes her relationship with Tyson will encourage others to adopt a bully breed, and just maybe their story will help Uma find a home for the holidays. "It would be absolutely amazing," Marinel said. "It would be a Christmas miracle." It's important for people to know that when you come to the shelter, if you see a dog barking like crazy from inside their kennel, it does not mean they're aggressive. In fact, often times they're just begging for affection. So, next time, stop and get to know them, and maybe they could wake up in your home on Christmas morning. For more information on adoptable pets, click here.